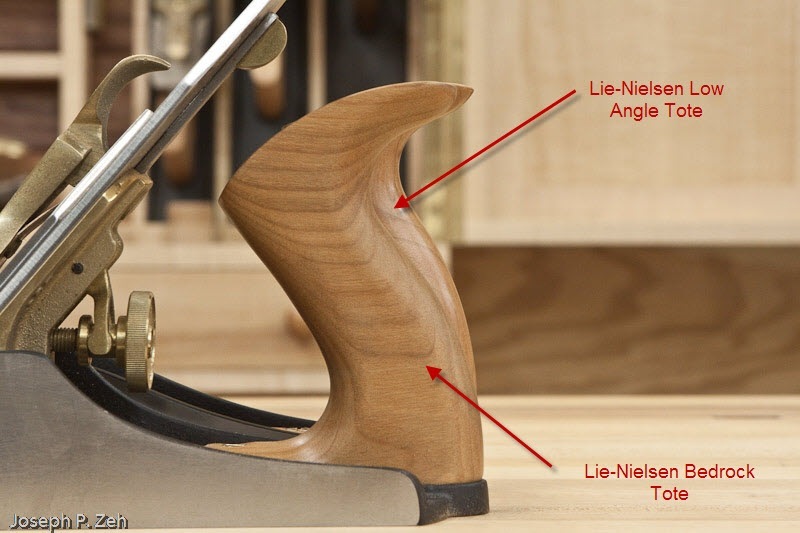 Much has been written about the relatively new bevel-up (aka low angle) planes from Veritas and Lie-Nielsen – most of it complimentary. 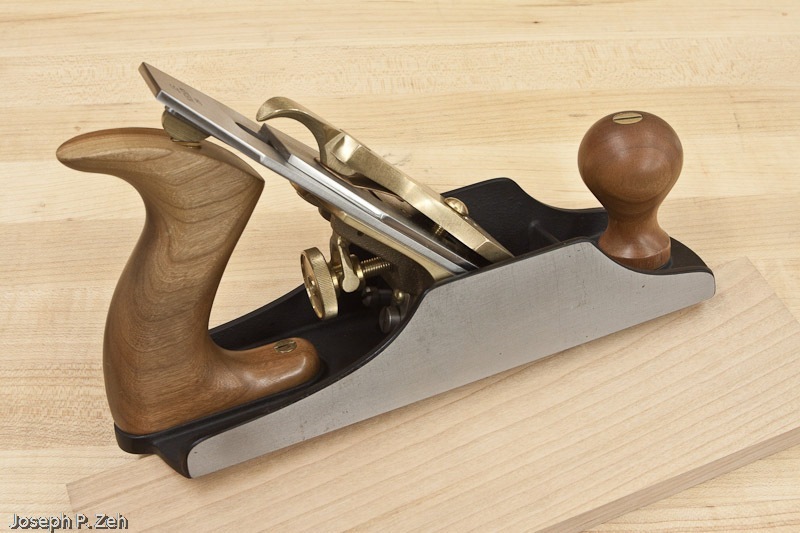 In particular, two woodworkers I admire, Chris Schwarz and Lonnie Bird, have been outspoken about the advantages of bevel-up planes. 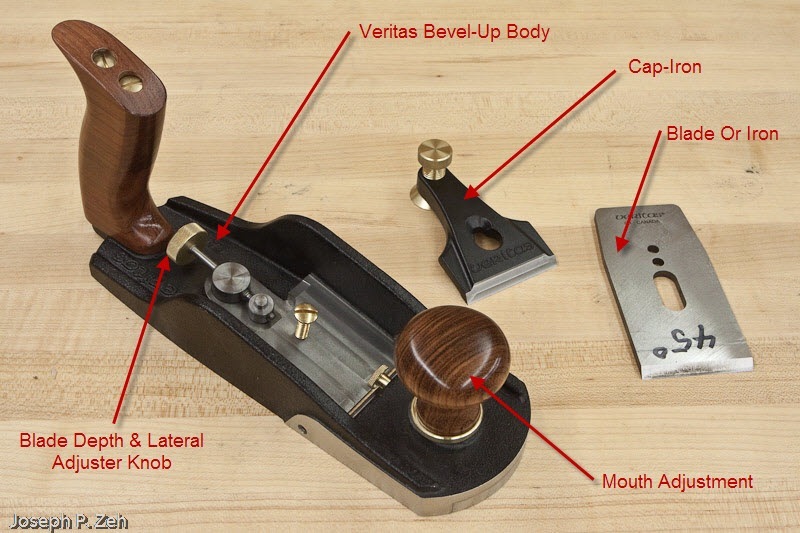 This month’s issue of Popular Woodworking (August 2009 #177) had a great article called The Case For Bevel-Up Planes by Lonnie Bird. Anyone trying to decide between bevel-up or bevel-down should read this article. My experience with bevel-up planes, however, has been quite different. I offer the following account to present a different view. 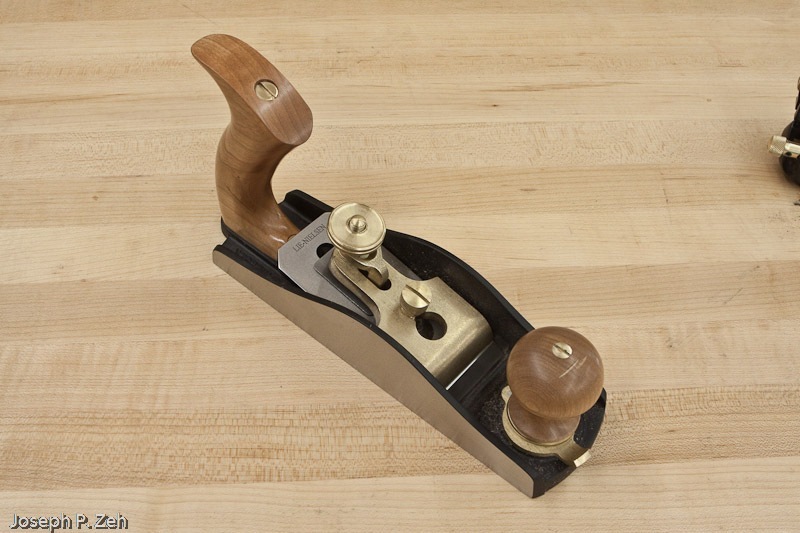 In December I bought my first low angle plane, a Lie-Nielsen LN-62 jack plane, largely on the strength of an article by Chris Schwarz. In March I bought a Veritas bevel-up smoother plane for a class I was to take at Lonnie Bird’s school. 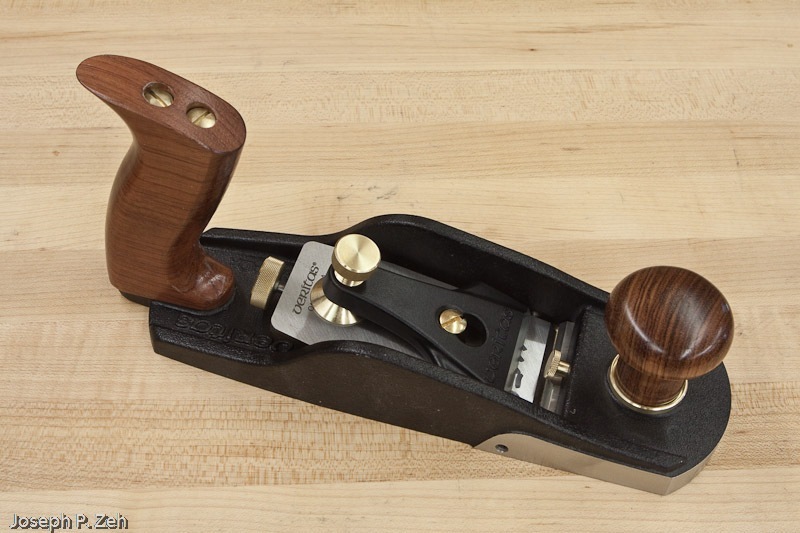 This was my first non-Lie-Nielsen plane and I felt like I was cheating on my wife when I purchased it. 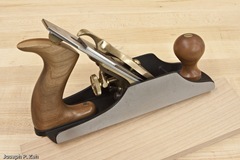 Somewhere in between I bought the Lie-Nielsen LN-164 smooth plane. In the intervening months I spent a lot of time tuning and using these babies, all along comparing them to my bevel-down Bedrock planes. As an engineer by education and profession I am no stranger to design analysis. When I analyze the design of bevel-up planes I am convinced they will perform better than Bedrock designs, cost less, set up easier and are more flexible. Yet, my side by side usage and comparison over the last six months have left me wanting to stick with the Bedrock design, what Lonnie calls the “antiquated” design. So why the disparity between what technically seems true, what the leading woodworkers say, and what my experience tells me? Part of this I believe is due to my (perhaps too long) learning curve. Perhaps I haven’t used bevel-up planes enough yet. But I am convinced that the disparity is in large measure real and physical. 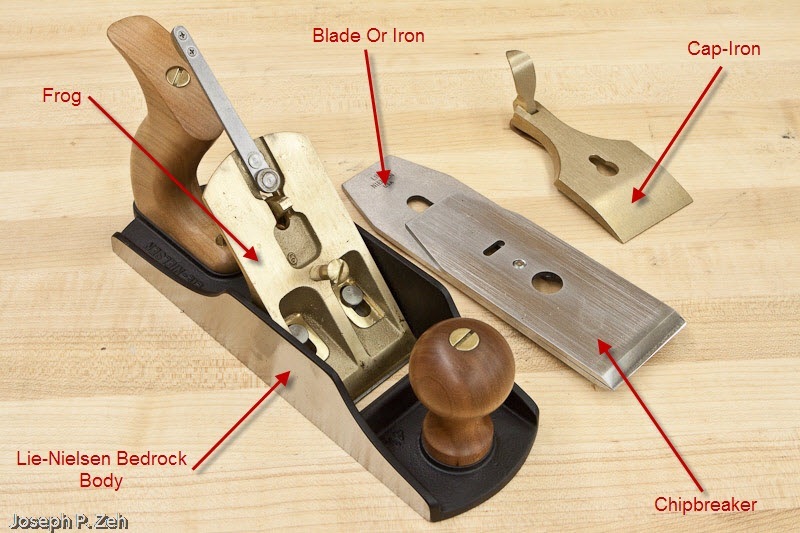 I agree with Lonnie Bird that bevel-up is the way of the future for all planes; largely because they have fewer parts, hence cheaper to manufacture and easier to tune. Both the Veritas and the Lie-Nielsen bevel-up planes have only three simple components; the body, blade and cap-iron (the Lie-Nielsen actually has four components if you count a small spacer). Compare this to the Bedrock design which has a body, frog, blade, chipbreaker and cap-iron. 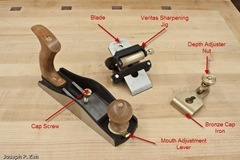 Also, you can buy one bevel-up plane plus two or three additional blades ground to several bevel angles and essentially have the equivalent of three or four planes. 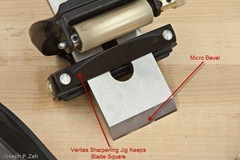 For example, Veritas offers a 25, 38 and 50 degree blade. Their planes have a 12 degree bed. Hence a resulting 37 degree low angle configuration for end grain, a 50 degree York configuration for well behaved grain and a 62 degree high angle for highly figured hardwoods. Three planes in one. In the Bedrock design you have to purchase multiple frogs to achieve this. Even then it is difficult to get a 62 degree cutting angle, which appears optimal for highly figured woods. All of that is true yet, call it feel, call it human engineering, call it whatever you want, but bevel-up designs are at least two generations away from getting it right in my opinion. While the Bedrock design has more parts and is more difficult to tune, like many woodworkers I have a number of planes tuned for specific purposes. This means I tune them once and avoid reconfiguring them so that I don’t have to tune them again for quite some time. What’s left after tune up is minor blade depth and lateral adjustments – and that is where the Bedrock design excels. The human engineering of the Bedrock design is such that you can make either a blade depth change or a lateral adjustment between strokes while returning the plane to the starting point of a pass. Both adjustments are right there at your finger tips. 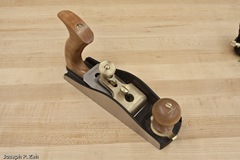 No hunting required, no need to turn the plane over or change hand position to make an adjustment. Also, both adjustments are silky smooth on the Lie-Nielsen Bedrock designs, and both are like vernier adjustments that give precise results. Contrast this to the Veritas and Lie-Nielsen bevel-up planes. The Veritas seems to be the most clumsy of the two manufacturers. The adjustment mechanism for both depth and lateral adjustment is a knob that is placed too low for the thumb or index finger to access without moving your hand from the handle. You can see this in the picture at right. Further, I find that if I tighten the lever cap to a degree required to keep the blade from shifting on its own the lateral adjustment is too tight to operate smoothly. 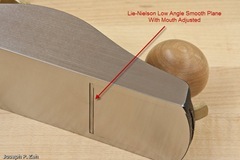 The Lie-Nielsen low angle design doesn’t require a lateral adjustment relying instead on a tighter machining of the bed alignment to the edges of the blade. 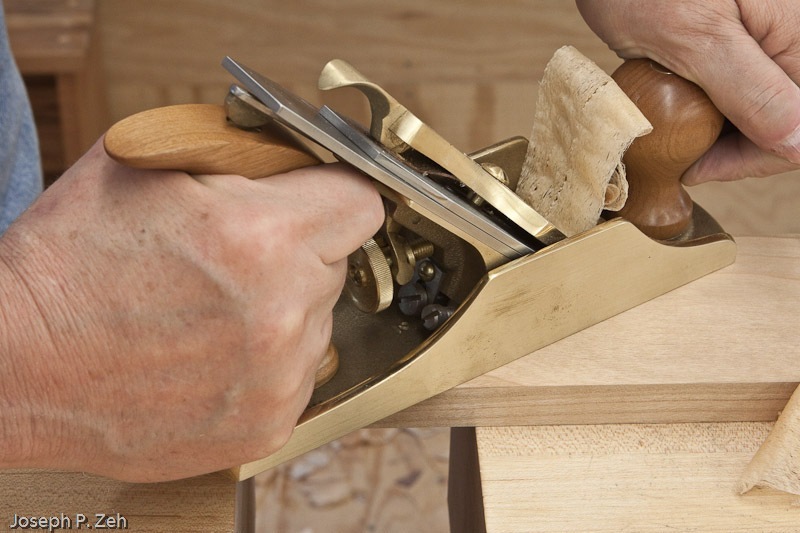 However this requires that the blade be ground and honed precisely at 90 degrees to the edges, a task that is easily performed, ironically, with the aid of a Veritas honing jig. The Lie-Nielson’s depth adjustment seems slightly better human engineered than the Veritas. Neither come close to the ease, smoothness and controllability of the Bedrock. 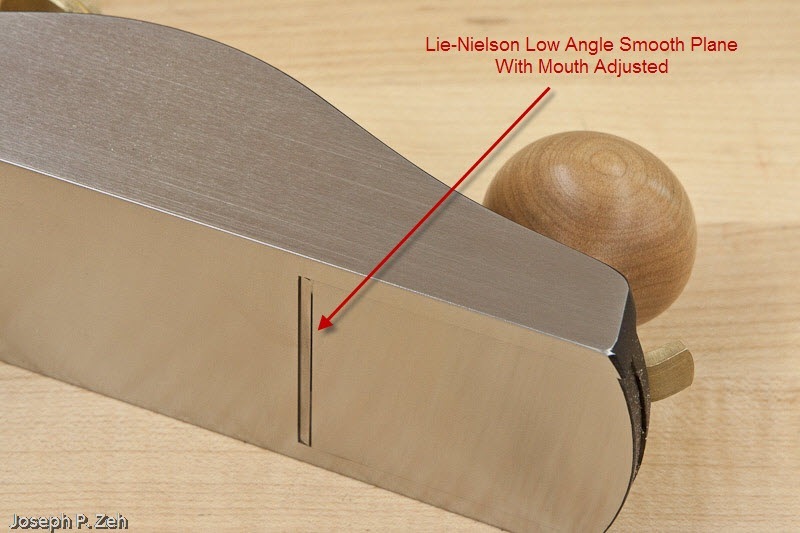 One of the features of the bevel-up design that is far superior to the Bedrock is mouth adjustment. Both the Veritas and the Lie-Nielsen planes make this easy. Simply loosen the front knobs, adjust the mouth and retighten. In the Bedrock design you have to move the frog position requiring the involvement of three screws. It is quite difficult. However, like I said, in practice this adjustment is rarely required if you dedicate your planes for specific configurations. Tuning a Bedrock is second nature to me since I have been doing it for so long. I can achieve wispy thin and wide shaving with very little effort. For some reason I can’t explain other than a learning curve, I can’t achieve a tuned state nearly as quickly with the bevel-up planes. This is puzzling to me but I can only hope it is not a permanent condition. The last part of this comparison is a somewhat nebulous factor, let’s call it feel. The Bedrock feels right in my hand. It’s beefy (those extra components have a benefit), the grips (tote and knob) are just right and everything is in reach without moving my hand from the grip. I can easily get in a zone and plane away effortlessly even with the 55 degree middle pitch. The bevel-up planes, on the other hand, seem too light; my hand and arm extension seems wrong; I find myself fighting the lower angle which is tiring. Look at the two pictures above comparing the totes of the Bedrock design versus the totes of the bevel-up planes. Notice that both Lie-Nielsen and Veritas bevel-up planes have a lower angle tote forcing your bodies forearm and shoulder lower. I suspect the designer’s rationale was that for steep pitch configurations you need to be pushing more behind the plane to compensate for the increased force required. That makes sense, but it’s unnatural; and you have to pay this price even for mid and shallow pitch configurations, which are the pitch configurations most often used in the shop. Maybe I am just too biased to allow for a new feel, I don’t know. But I have been at this comparison for nearly six months and still haven’t achieved the advantages my engineering analysis, and the woodworkers I admire and aspire to be, say I should. So for now I’ll stick with my Bedrocks thank you.